Olympic Work Table Caster Kits includes (4) 5" work table caster with brakes that fit standard (1-5/8" or 1-1/2" ID tubing. Each caster is constructed of durable, non-marking high modulus rubber. NSF listed. 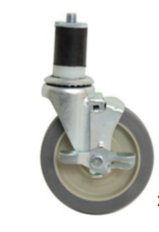 One order equals (4) casters.